“I’m amazed by and enjoy learning something new from each pup I meet." Kristina Finney has a passion for helping families learn how to communicate better with their animals and helping animals enjoy learning. Kristina began training dogs at an open-access shelter, where she was handed a clicker and quickly learned how a few manners could make all the difference in a dog’s adoptability. Kristina quickly became passionate about helping to train rescue dogs throughout their journey from the shelter to their forever homes. Kristina thereafter became a behavior volunteer working with dogs requiring extra help, served as a foster coordinator training and supporting foster homes, and conducted behavior assessments for stray and surrendered dogs. Kristina now serves as a behavior and medical foster for dogs and cats in need through local shelters and As Good as Gold—a golden retriever rescue organization. A passion for science-based methods and an approach through which animals enjoy learning led Kristina to pursue training with the Karen Pryor Academy. This helped Kristina learn the art of rewarding the behaviors we want to see and understand how force-free training using positive reinforcement creates positive bonds between humans and animals while providing exceptional training results. Kristina enjoys teaching group classes to help train pups to be well-mannered, loving companions and to flourish in their forever homes. She works with clients to develop and implement creative, realistic solutions to address behavior issues. 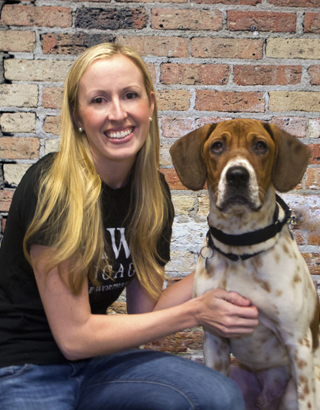 Kristina joined the PAWS Chicago team as a Canine Behavior Trainer in 2017. All levels of obedience and Polite Puppy classes. Kristina's dogs: Kristina has shared her life with dogs of all sizes and a variety of breeds, and particularly enjoys the lovable Staffordshire Terriers and Golden Retrievers. Kristina currently fosters a variety of canine companions. Fun Fact: Kristina has a cat named Fishsticks who does not like seafood.